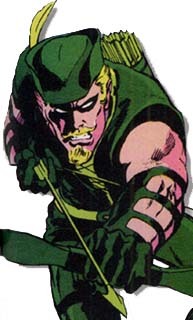 Born into the lap of luxury, Oliver Queen was an only child in what most would consider to be a decent household. As a child, Oliver loved to the stories of Robin Hood, so one Christmas his parents bought him an archery set and paid for him to have lessons. Oliver loved the set and continued studying archery for several years, up until he started High School. Upon graduation, he entered college and began working on getting his B.A and then masters in business management and economics, so he could take over his father's business. It was while in college that Oliver became involved with various political movements, such as the Civil Rights and Feminist Movements. Upon getting his masters, Oliver was given control of the company and made CEO of Queen Enterprises. Oliver tried to be a responsible businessman as well as a friend of the people and philanthropist. He donated large sums to various charities, even setting up a Queen Foundation to help the less fortunate. Still, Oliver couldn't help but think he was betraying his hippie roots and that he was as much a part of the establishment as the people he had fought in his youth. This depressed Oliver and he turned to in wine, women and song to keep his mind off those thoughts. Well, not so much song as the wine and women. It was some months later on the yacht Kristina that Ollie would fall overboard in a drunken stupor. He would later wash up on an island in the Solomon Chains. Oliver realized he had little chance of surviving... after all, the most strenuous thing he had ever done before was stir a martini. Remembering his childhood hobby, he crafted himself a crude bow and some arrows and hunted... and to his surprise... he flourished at it. He was shipwrecked for months, during which time he mastered the bow and arrow. He got back to the mainland after capturing a group of marijuana farmers who came to check on a crop they kept hidden on the island. Ollie grew bored after his return, making the decision to become a costumed crime fighter after he stopped a robbery at a costume party. While Ollie would much rather had gotten a name like "Shaft", he was labeled "Green Arrow" by the local press. Still in time, Ollie began to take his role as a hero more seriously. Especially after he found himself with a young partner: a boy named Roy Harper; a young fan of his, whom he adopted after the Indian who adopted Roy after his birth father died wrote him and asked for help. It was also about this time that Oliver began to use his famous "trick arrows" for emergency situations. 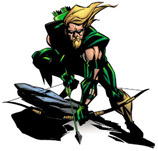 After a year of fighting crime with Speedy in Star City, Oliver gained some national attention fighting alongside the first five members of the JLA. Although he called it "slumming" when interview by the press, he really was impressed by the five other heroes after their first encounter. It was while in the JLA that Oliver met two people who would forever change him; Hal Jordan and Dinah Lance. The former would team up with Ollie on many occasions over the coming years and become his best friend. The later, would also team up with him on many occasions and become his lover. There were other changes too: ones not quite as positive as the gaining of new friends. Things took a turn for the worse when, through a combination of neglect from Ollie spending so much time as Green Arrow, most of his fortune going into various charities and the machinations of a business rival resulted in Ollie loosing his fortune. He and Roy were forced to move into an apartment in the slums of Star City. And with Oliver gone doing things with the JLA, Roy would start using and then become addicted to heroin. Discovering this would drive a wedge between Ollie and Roy, forcing the two to part ways for many years. Ollie's relationship with the JLA also collapsed and he and Diana both moved to Seattle where they converted a three-floor brownstone into a florist/apartment for the two of them. Dinah ran her business and hired Ollie as a deliveryman. It was during the next year that the two would establish themselves of the protectors of Seattle, taking on gangs drug dealers, the Mafia and The Tong. 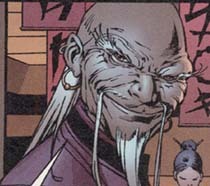 It was during their time there that Ollie would become involved with a mercenary named Eddie Fyers and a Japanese female archer named Shado. 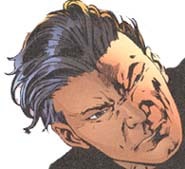 It was also during their first case that Ollie willingly killed for the first time, after Dinah was captured and tortured by the drug dealers they were trying to find. Ollie wound up with a "bonus" from the job... a bag full of laundered money from the Iran-Contra scandal that later found it's way into various charities and a secret Swiss bank account. Rob from the rich, indeed. Ollie and Dinah had some rough times in Seattle, Dinah finding out that she was barren thanks to her tortures at the hands of the drug dealers. Their relationship took a hard hit shortly after that when they discovered that Shado had Ollie's child when he left Seattle for a time to help her fight Yukaza assassins. It didn't matter much to Dinah that Shado took advantage of Ollie while he was unconscious. Ollie wound up forming a band of Merry Men of a sort from the local homeless population, who helped him by giving him information of various crimes, including the unexplained murders of several homeless people. Among them was a girl named Marianne, whom the two took in as a clerk. Oliver left Seattle and Dinah for good, after an incident where Marianne kissed him on New Years Eve and he was slow in stopping her. He journeyed the country for a time looking for another cause to tie himself to... another right to wrong. He met with his old friend Hal while on this journey and they camped out together for the last time, the two trying to comfort each other; Hal for the loss of his home town, destroyed by the Cyborg and Mongul and Ollie for the loss of his love. Still, Ollie was powerless to stop what happened next: his best friend going mad and deciding to rebuild the universe the right way. Ollie stood with all the other heroes of the world... taking a final stand against Hal, now called Parallax. In fact, it was Ollie himself who shot the final blow against Hal. Distraught over the loss of his best friend, Oliver returned to the monastery where he had gone the first time he had quit the JLA. It was here he met a young man named Connor Hawke. Over the next six months the two became quite close friends. Of course Ollie didn't know it at the time, but Connor was his son... the result of a tryst back in his Star City activist days in college. Connor decided to help Ollie get back into the costume; he even made a Ollie a new costume and made a similar one for himself. The two teamed with Eddie Fyers and traveled together for a while. Ollie didn't learn about Connor until he was summoned into the desert by Parallax, who told him. Oliver left Fyers and Connor on bad terms, upset that Connor hadn't told him right away that he was his son. From there, Ollie fell in with a group of terrorists called the Eden Corps, who planned to blow up Metropolis with a bomb in a plane. Ollie, in an attempt to keep a bomb from being set, grabbed the deadman switch that kept it from being triggered. The plane burst into flames, far away from Metropolis. No body was ever found and Connor, after talking to Dinah and making a memorial for Ollie, took up the title of Green Arrow for himself. Hearing of the incident, Parallax went back in time to a split second before the plane exploded and pulled Ollie out of the plane. What happened after that is not well known. Stories come from around the country, of a man with a bow who stands up for those who cannot defend themselves, like Robin Hood of yore. The most well accounted stories had him teaming with a girl with a bow. 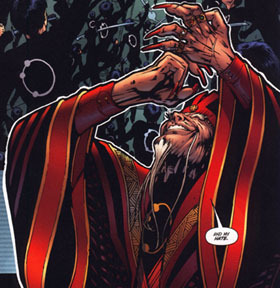 Although where he is right now isn't known, it appears that fate still has something in store for Oliver Queen. Age: The term Fart is often used.